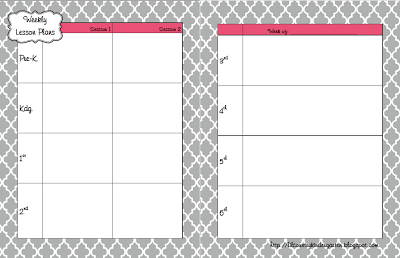 It's amazing that all it takes to inspire me to FINALLY create my lesson plan template for next year is a few cutesy digital papers! :) Feel free to click on the picture to download a copy if it would be useful for you. The graphics are from Sonya DeHart Designs and Print Candee. Since I will be a teacher librarian next year with classes from Pre-K to 6th grade with a fixed class schedule, I wanted a template I could use for planning a week at a time. I'm hoping this will work for me. Last year, I used a planner like the one picture below that I had won in a giveaway. What do you use for your weekly planning template? I was using the same template as my teachers, but I'm going to have to change it. I've picked up more Reading RTI groups so the regular template isn't' working. I think I'll start using a four page spread for next year. That way I can keep library classes, computer lab classes, and RTI groups all organized more efficiently. Yes, I have all three.